For the past couple of months, somnology Tom and I have been training for the A1A (Beach-front avenue!) Half Marathon and Sunday was the Big Day. For me, training was both exhilarating – you feel so accomplished when you’ve run a 10K before breakfast – and painful – patellar tendinitis isn’t particularly fun. Training made me hungry, made me hobble around like an old lady, made me stop drinking beer and wine on Saturday nights (the worst part by far) and made me actually stop wearing heels. On the Big Day, we woke up at 3:30AM and had some homemade power bars and bananas and were on our way. The weather was great – 60 degrees – and we started our run heading east toward the most beautiful sunrise over the ocean. I didn’t have my best run, but Tom ran with me (almost) the whole way and my official time was 2:05:15. We crossed the finish line with our families cheering us on and then celebrated with a nice, big breakfast of French Toast, Eggs, Bacon and Bloody Marys. All in all, a wonderful, completely exhausting day. 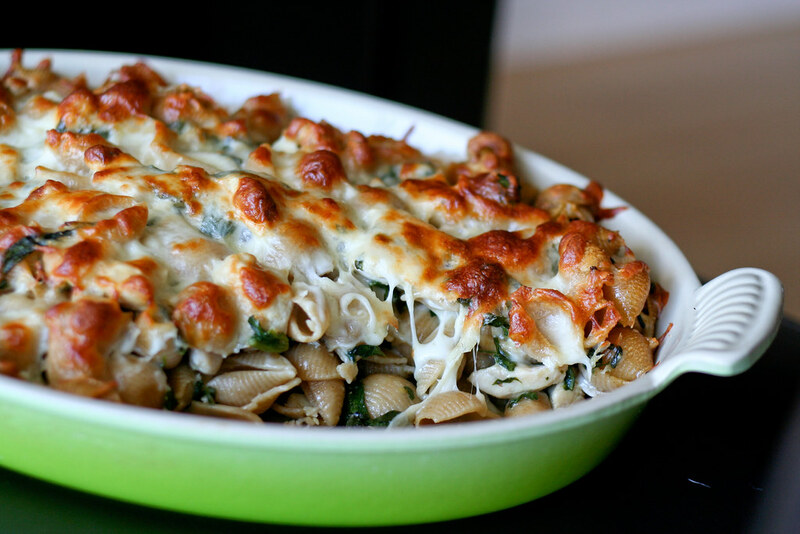 So, what does all that have to do with Baked Chicken & Spinach Pasta? Well, it was all part of our pre-race meal. This dish is one of those things my mom made all the time when I was growing up and my brother and I loved like crazy. It’s a super simple recipe: sauteed chicken with lots of garlic, olive oil, spinach and white wine all tossed with pasta, covered with cheese and baked. Delicious. So, I made a batch and my mother-in-law made Tom’s favorite spaghetti and meat sauce and we all carbo-loaded on Saturday night before the Big Day. Perfect pre-marathon food, but good pretty much all the time. And now, I’ll happily return to beer and wine on Saturday nights, heels at work and a lot less pasta recipes on the site. Preheat the oven to 350°. Set a large pot of water to boil. Once it comes to a rolling boil, salt it and cook the pasta until just al dente. Drain. While the pasta is cooking, set a large skillet over medium heat. Once it’s hot, heat the olive oil then add the chicken. Brown the chicken on all sides – about 10 minutes. Add the garlic and simmer with the chicken until it’s fragrant and begins to turn golden – about 3 minutes. Add the salt. spinach and white wine to the skillet and cook for an additional 3 – 5 minutes, or until the spinach begins to wilt. Toss the contents of the skillet with the pasta and place in a casserole dish. Cover with cheese and bake for 25 minutes. Congratulations on your run! My son is a marathon runner so I can appreciate your carbo load up the night before, and your family cheering you on! Quite an accomplishment!! Congrats. And this dish looks delish!!! Congrats on your marathon! The dish looks great – simple and satisfying. 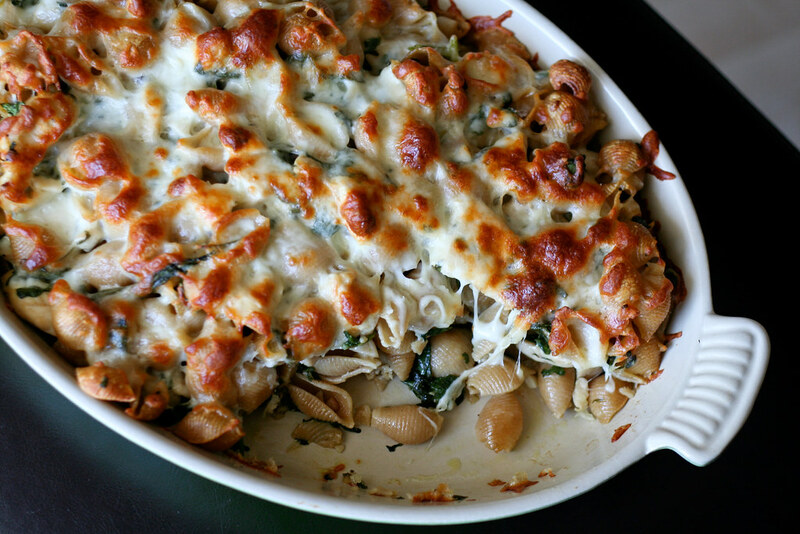 This really does look perfect for carb loading (or just for dinner tonight)! I’ll have to save it and try it before my next race. LOVE it! I am also training for a 1/2 marathon so I will definitely be utilizing this recipe before the big as well as during training! Sarah – I know. We’re already talking about doing the half at the Miami ING next year. I don’t think my knee will ever be able to handle a full though :) Next up, a series of 3 sprint triathlons this summer! morgan – Awesome! When’s your race? With all those ingredients it has to be good! Unfortunately I’m not a runner but I will definitely be making this anyways! yay for your half!! This looks really tastey….I’m a runner as well and always looking for new pasta dishes. And I cannot WAIT to try out your homemade powerbars! happy to have found your blog! Congrats on your run! Just stumbled on your blog and love it! Although, I have no idea how you ate that much after! After my half marathon I couldn’t even think about eating! That sounds delicious…I love your gratin dish…I have it in flame. Funny, I’ve been to your website before, but was just browsing TasteSpotting in search of a recipe to make for my boyfriend, who is running the LA Marathon next weekend. And lo and behold, I find this perfect recipe. I will be trying this out pre-race, thank you for your always wonderful recipes and beautiful photos! Made this the other night for my bf and I….we are are coming up on our first 1/2 marathon next Sunday! We downed this fantastic recipe. I added some chopped up sun-dried tomatoes for an extra flavor kick….or perhaps i prefer sun-dried tomatoes with EVERYTHING. Also did your candy-cane cookies over Christmas…what a hit, brought back alot of memories for the older folks in the room. Congratulations! What a fantastic accomplishment!!! Congrats on your run, and thanks for this recipe! I’m training for the Boston Marathon, and I fueled up for my 20-miler tomorrow morning on this pasta. Delicious! I’m looking forward to leftovers for the rest of the week! It truly is awesome to discover innovative inspiration for tasty recipes along with straightforward approaches to fix them. My husband and I cooked this dish for our supper at the weekend. Everybody enjoyed it, most definitely I’ll be preparing it regularly now. Hi, I just found your site and I love it! This is funny because I also ran my first half marathon this past spring and went through the exact same thing. Kudos to you! Will be trying the recipe along with the other wonderful ones found here… thank you! Bland. Casseroles generally have a liquid component. Not this one. Dry, plain, don’t bother. I’ve no time for those who eat like pigs after which look for magic pills, diets and programs. If you eat too much, you will be fat no mater what. And i am not particularly slim but I actually do run and feel healthy, without feeling hungry at all times. Get a grip folks! Printed it out and am making it tonight, thanks! This sounds phenomenal. I’m trying to find delicious meals to cook next year when I move into a house with my roommates for school and this sounds like a perfect recipe. Congrats on the race! Next time I think I’ll add a light sauce. It was good, but just a little bit bland for my tastes. Thanks for the recipe! Hi – your recipe was a super success! I had to make dinner for 12 Bunkettes and everyone went back for seconds and thirds! Even my picky son and husband snuck several helpings! I doubled all the ingredients but not the garlic — it was wonderful — THANK YOU!!!! Hi! I made this for my family tonight and it was a huge success! I cut the recipe in half and still have plenty for leftovers. Thanks for sharing, this will be going in my dinner favorites! This was nasty. Very dry and a waste of ingredients. Pretty good with homemade alfredo mixed into the pasta shells prior to baking. Three of us here. All saying dry and tasteless. Will have to come up with a sauce to save this dish. Otherwise, a waste of time and money. be a single one loophole. Assign static IP addresses to your network’s devices. Most business software requires a minimum of five seats, while personal computers requires a single PC but can only protect up to 10 computers.